Wedding Photographers in Malibu have the benefit of the gorgeous California sun shining down on all of their pictures. This Malibu wedding was an event to remember, with a breath-taking beach ceremony and a reception with incredible views of the Pacific Ocean. Wedding Photographers in Malibu also must be sure to capture the precious moments that occur before the celebrations begin. 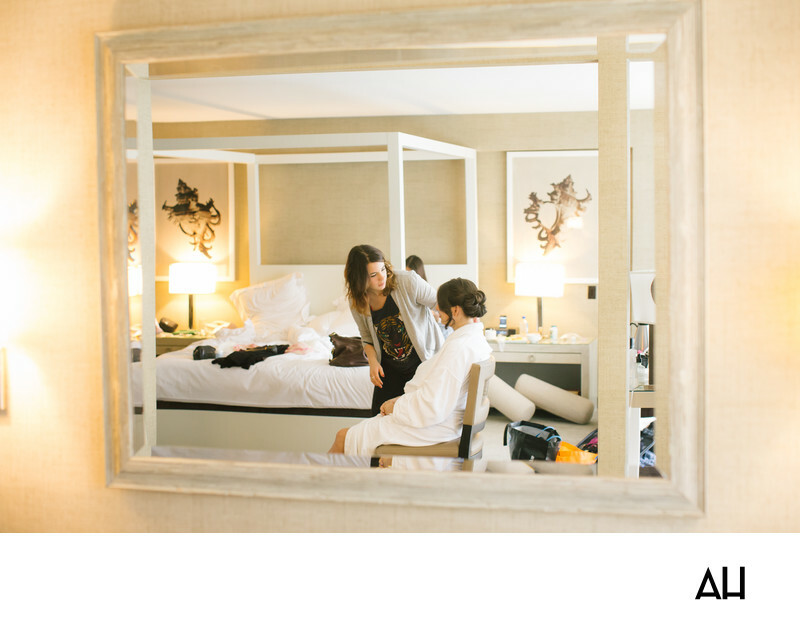 This image shows a Malibu bride preparing for her day. Bridesmaids mill about the room as a makeup artist highlights the bride’s already beautiful features. Her hair has been done, and soon she will be ready to slip into her wedding gown. The hotel suite that has become the setting for the bride’s dressing room is awash in a warm light from the sun that blazes in through the windows. The room is pristine, with ivory walls and white furniture. It is a pure scene, and surprisingly calm considering the amount of energy that has been buzzing about the space all morning. The bride’s dark hair is pulled up into an elegant updo. She sits patiently as the makeup artist completes her look. For now the bride wears a big, fluffy, white robe. This is so that nothing will happen to her wedding dress before the celebrations begin, and so that she can easily change into it without compromising her makeup or hair. In a few moments she will put on the dress, and be completely transformed into a bride. Moments like the one pictured, are sentimental for the bride and having a picture of these scenes give her keepsakes of the seconds that lead up to her becoming a wife.